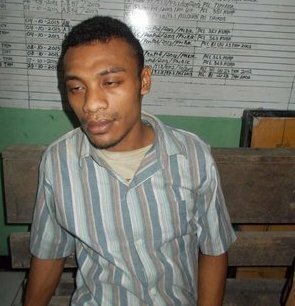 Yesterday the district court of Biak, sentenced Oktavianus Warnares to three years imprisonment for raising the “Morning Star” flag in Biak on May 1, 2013. Four others were also sentenced for the same “offence”, Markus Sawian was sentenced to two years in jail, George Simyapen 2.6 years, Yosef Wamaer two years and Yosef Arwakom 1.8 years, in jail. The men were arrested after the Indonesian police and military opened fire into a crowd of people gathered for a flag-raising ceremony on the 50th anniversary of Indonesia’s annexation of West Papua. In their consideration, the judges stated that their activities had threatened the existence of the Unitary State of Indonesia. The trial of Yohanes Boseren who was also arrested for the same offence remains suspended due to mental health issues brought on by heavy beatings at the time of his arrest. Despite lawyers’ calls for his immediate release, Boseren is still being held in Biak prison. The Free West Papua Campaign along with other campaign groups is extremely concerned for Yohanes and call for him to be immediately released along with the other prisoners. 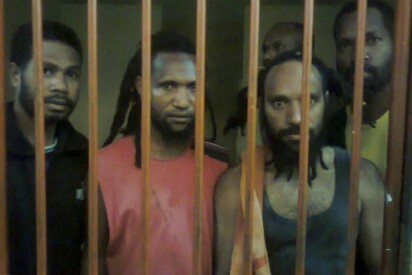 The long sentences echo those of many others who have been imprisoned simply for raising the West Papuan flag. Most notable is the Amnesty International prisoner of conscience Filep Karma who is serving a 15 year jail sentence for his involvement in a flag raising ceremony. To find out more about these and the many other political prisoners in West Papua and what you can do to support them please follow the links in the “Take action” section to the right.